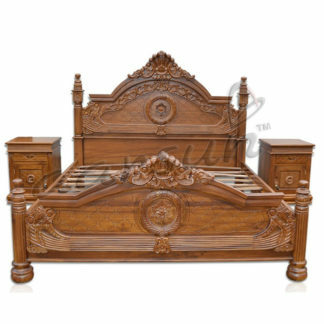 A traditional design with just the right amount of elegance is characterized and emphasized in Wooden bed. The cot design makes it traditional and classically appealing. The neat lines and angular cuts present its classic design language in a precise and visually attractive manner. The low head board offers ample support and imparts it an airy design. Traditional designs in all their essence are utilitarian and carefully crafted to enhance the life of the furniture. Wooden Bed is crafted out of solid hardwoods. Sheesham and Teak are two variants available with us. Both these woods have a remarkable grain and are extremely durable. Both Sheesham and Teak also resist warping and shrinking, and teak has a natural quality of being moisture resistant as well. Beds with regular storage come with hinges. They are good for storing bulky items which you might require to access occasionally. Many people also prefer to go for storage space under deewan beds. They are easy to use and also very multi functional. 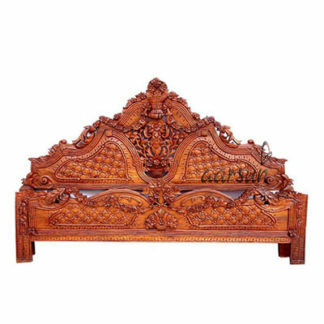 Handcrafted Wooden Bed is available in different sizes, ranging from single bed to full fledged king size bed. Suitable for a master bedroom, Aarsun Woods Bed presents a very breathable design which gives an illusion of more space in a room. Also there are various wooden finishes available for you to customize it to suit your own preferences.